allurescent: She Moves in Her Own Way; Mia Moretti. She Moves in Her Own Way; Mia Moretti. Ultimate cool-cat Mia Moretti has already made a big impression on the DJ'ing scene (and also as one half of band The Dolls) but is quickly becoming a massive style icon and dare I loosely use the term 'celebrity'. As a good friend of Katy Perry's, Moretti is more well-known in the US but I love her fashion so much I had to dedicate a post to her. Her style is to die for, flaunting various designer labels that are styled effortlessly! 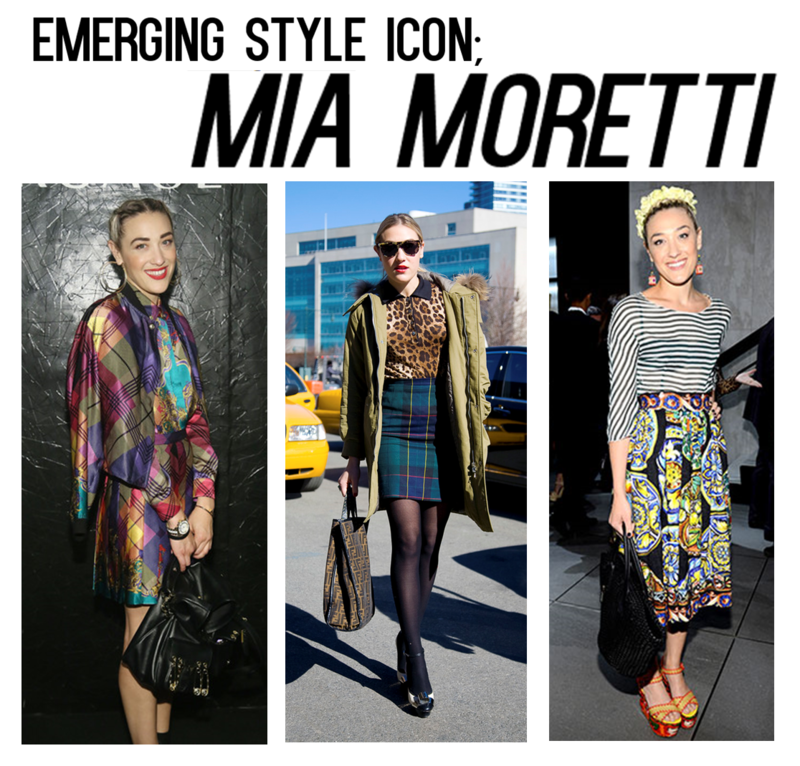 As you may have gathered from my posts in the past, I have such a soft spot for prints to which I am beginning to think Moretti is the queen of! The metallic checks on the first picture is a trend I would love to see hit the high street and think it is a great transition from the harsher tartan/check/punk trends that are swamping the fashion scene at the moment. I absolutely love how Mia looks so cool and casual in the checked bomber style skirt/suit combo. She creates a perfect mix of dressing to impress but injecting her own effortless nature into her outfits. I am also in love with her dress in the bottom right of this post. I'm definitely going to keep up with Mia's fashion as I think all eyes will be on her in the near future and can't wait to see how her profile develops! You can read an article about Mia in her band The Dolls on ELLE's website here where she talks about how clothes having the ability to transform a mood. Mia is also the face of a slightly under the radar/upcoming fashion designer Emerson for Spring 14, she looks gorgeous in the promo photos and I'm excited to see what this new designer has to offer! Read full article on style.com 'The Next Big Thing: Emerson, Spring '14' which is also the source of the following photo showcasing the collection. I adore the exploration of textures with the floral detail on the sophisticated purple dress and love the slight addition of colour to the horizontal monochrome stripes on the right; in addition to the extra texture of the mesh panels. I've posted about monochrome with a hint of colour being the next big thing before which you can read here. P.S. If you like Mia's style follow her tumblr for fashion/music updates and just general artistic inspiration; she's undoubtedly shaping up to be my favourite fashion icon. Thanks for your lovely comment and for following :) Follwed back. She has a very unique style. It suits her very well. she is a very unique person!